This is not the best DBZ movie but by no means the worst. There is plenty of violence and no curse word is spared. The Godzilla-esque monster Hildegarn is quite awesome espcially his teleportation technique. Goku's Dragon Fist is quite an attack. Goten and Trunks have plenty to do and are the main source of the comic relief. As a DBZ movie I'd give it a seven-out-of-ten. The instrument which plays the melody in the movie is an ocarina. Gohan: Father! It has a weakness! Goku: Intense emotions drain it's energy. That's when it can be attacked! Goku: You call that a punch? You'll have to do better then that! 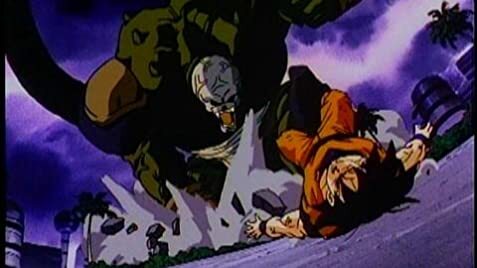 The end credits are played over footage of Future Trunks killing Frieza with his sword.